Dr. Azim Shariff is a social psychologist whose research focuses on where morality intersects with religion, cultural attitudes and economics. 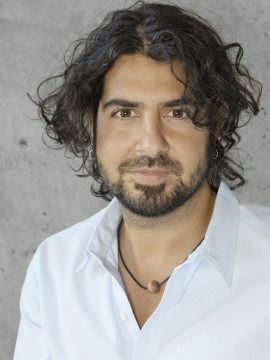 Another rapidly expanding part of his research looks at human-technology interactions and the ethics of automation, including self-driving cars. Dr. Shariff's research focuses on where morality intersects with religion, cultural attitudes and economics. Another rapidly expanding part of his research looks at human-technology interactions and the ethics of automation, including self-driving cars. Mercier, B., Kramer, S.R. & Shariff, A.F., (in press). The Belief in God: Why People Believe and Why They Do Not. Current Directions in Psychological Science. Shariff, A. Rahwan, I., Bonnefon, J.F. (2017). Psychological roadblocks to the adoption of self-driving cars. Nature Human Behavior, 1, 694–696. Shariff, A.F., Wiwad, D., & Aknin, L.B. (2016). Income Mobility Breeds Tolerance for Income Inequality: Cross-national and Experimental Evidence. Perspectives on Psychological Science, 11(3), 373-380. Norenzayan, A., Shariff, A.F., Gervais, W. M., Willard, A.K., McNamara, R., Slingerland, E. & Henrich, J. (2016). The Cultural Evolution of Prosocial Religions. Behavioral and Brain Sciences, 39, 1-65. Shariff, A.F., Willard, A.K., Andersen, T. & Norenzayan, A. (2015). Religious Priming: A meta-analysis with a focus on religious prosociality. Personality and Social Psychology Review. Shariff, A.F., Piazza, J., & Kramer, S.R. (2014). Morality and the Religious Mind: Why theists and non-theists differ. Trends in Cognitive Science, 18(9), 439-441. Shariff, A.F., Greene, J.D., Karremans, J.C., Luguri, J., Clark, C. J., Schooler, J.W., Baumeister, R.F. & Vohs, K.D. (2014). Free Will and Punishment: A Mechanistic View of Human Nature Reduces Retribution. Psychological Science, 25(8), 1563-1570. Markowitz, E.M. & Shariff, A.F. (2012). Climate change and moral judgement: Psychological challenges and opportunities. Nature Climate Change, 2(4), 243-247. Laurin, K., Shariff, A.F., Henrich, J., & Kay, A. (2012). Outsourcing punishment to god: Beliefs in divine control reduce earthly punishment. Proceedings of the Royal Society B: Biological Sciences, 279(1741), 3272-3281. Norenzayan, A. & Shariff, A.F. (2008) The Origin and Evolution of Religious Prosociality. Science, 322 (5898), 58-62. Shariff, A.F., & Norenzayan, A.Psychological Science, 18, 803-809.